Many people mistakenly believe that a physical ball is required to practice T’ai chi ball. The real ball is the ball of ch’i or life force or energy. One form of this ch’i is brought into the body by breathing. Through correct breathing practice this ball of ch’i is nurtured and held in the abdomen. Its external manifestation is the imaginary ball which is gently held in line with the lower abdomen when starting to form the “ward of positions” in the T’ai chi form. Through relaxed repetition of the form and the use of correct breathing, these reserves of ch’i are nurtured and refined. Traditional Chinese teachers describe correct breathing as “breathing from the belly”. This involves using the full flex of the diaphragm, drawing in air through the nose and down into the bottom of the lungs. The feeling of expanding a relaxed abdomen should be noticeable as the diaphragm flexes down to draw in the breath. 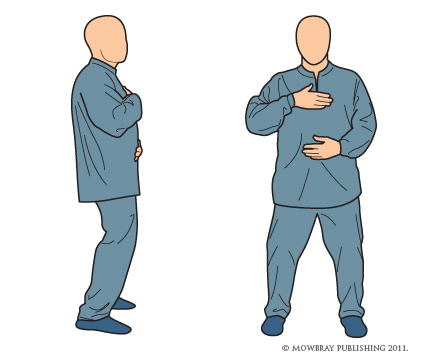 This is best achieved standing up in a relaxed position with one hand held against the abdomen and the other against the chest. This allows you to feel the abdomen expand as the air is drawn in. You can visualize the air being drawn in and down through the chest and into the lower part of the lungs. Try to keep your neck and shoulders as relaxed as possible. As you feel the air drawn down, put your attention into the belly to help facilitate the downward flex of the diaphragm and the sense of filling the “belly”. This fills the lower lungs with air. The specific point to feel that fullness is the lower “tan t’ien” point, which is one and half inches below the navel and one inch into the stomach cavity. The other way to measure to find the location of the lower tan t’ien is three finger widths below the navel and two finger widths into the body. As the slow inhalation continues, the air should fill the upper part of the lungs, which can be felt by the other hand as the chest rises and expands. Exhalation should also be slow and preferably slower than inhalation. Emptying the upper lungs first and so feeling the hand sink with the chest, followed by the emptying of the air on the lower part of the lungs .This has the effect of making you aware of the diaphragm working the lungs like a bellows. As this pattern of breathing becomes habitual it should be applied in any position and without the hands monitoring the chest and abdomen. Try to be aware of slowing down the breathing rate. Our normal rate of relaxed breathing is about eight breaths per minute. As we develop the above habit of breathing from the belly or abdominal breathing, our breathing will naturally slow to about four breaths per minute. The developing of the “ball of ch’i” internally is far more beneficial than playing with exercise balls.